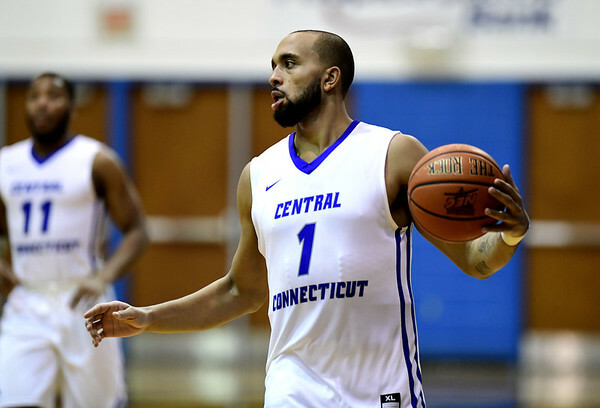 NEW BRITAIN — The CCSU men’s basketball team appeared to be heading for another disappointing finish in NEC play, trailing Bryant by 13 with just over eight minutes remaining. The Blue Devils, sitting at 3-6 in conference play, had watched a six-point lead turn into a seven-point deficit at the end of the first half after four 3-pointers by the Bulldogs, including one at the halftime buzzer. Shortly past the midway point of the second half, the air was blown back under the wings of the Blue Devils, who suddenly turned a corner and finished the afternoon on a 21-3 run to stun the Bulldogs with a 64-59 victory. The win for CCSU came just hours after the women’s team erased a 13-point second half deficit. Unlike the women’s team, the Blue Devils didn’t ride a wild buzzer-beating 3-pointer to victory, instead undergoing a complete change of identity on the defensive end, as CCSU held Bryant scoreless for over five minutes during the decisive second half run, one that reached 15-straight points from the Blue Devils. Bryant was held to just 1-for-14 shooting from the floor for a span of more than eight minutes while CCSU made its run. After cutting a previous 13-point deficit to six, the Blue Devils allowed an 11-4 run from Bryant to put themselves back in the same hole they were in just minutes before. Once again, the Blue Devils battled back, scoring five points in 50 seconds to pull back within six. This time, they would complete the comeback. With two and a half minutes remaining, Michael Underwood banked home a three to cut the six-point deficit in half, followed by a driving layup from Kohl to mark a 10-0 run for CCSU. It became 12-0 after a pair of free throws from Kohl with one minute remaining. Kohl would add three more to give CCSU the lead off a personal 7-0 run. “The past two games we’ve been playing together, and you can see it.” Kohl said of the Blue Devils’ current winning streak. From the halftime buzzer until CCSU’s torrid stretch of defense and offensive efficiency from Kohl, the start of a winning streak seemed like a fantasy. Up six with two minutes left in the first half, Bryant’s 3-point shooters caught fire. Entering the game as the worst three-point shooting team in the NEC, the Bulldogs came alive from deep as Byron Hawkins and Adam Grant each knocked down a pair of 3-pointers, igniting a 12-1 run for the Bulldogs, who turned a six-point deficit into a seven-point lead in less than 120 seconds. While the Bulldogs took control in a flash, the Blue Devils took a more gradual approach in the second half, putting together consecutive stops on the defensive end until the shots finally began to fall. The Blue Devils found their shooting stroke at just the right time, while the Bulldogs exhausted their 3-point magic at the end of the first half. Posted in New Britain Herald, CCSU on Saturday, 2 February 2019 20:29. Updated: Monday, 4 February 2019 17:44.